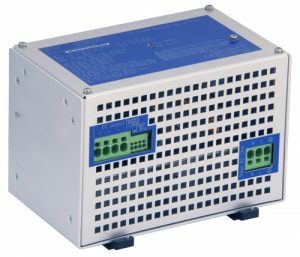 The Power Supply type PSD1220 is an anodised aluminium unit. • ATEX, IECEx Certifications (pending). • TÜV Functional Safety Certification. • Type Approval Certificate DNV for marine applications (pending). Three independent over voltage protections: 1 voltage limiting loop at 30 Vdc and 1+1 crowbars at 31 Vdc. Units are SIL2/SIL3 according to IEC61508:2010 Ed. 2 (pending approval). Better than 87% efficiency with 0.98 Power Factor Correction. Wall, DIN-Rail, 7″ or 19″ rack mounting versions. The PSU1003 is an intrinsically safe potted module approved as a sealed component in a 55 x 30 x 15 mm plastic enclosure with soldering pins for PCB mounting. The unit can be installed in Hazardous Location Div.1 (Zone 0), Gas Group C-D-E-F-G (IIB-IIA), T4. 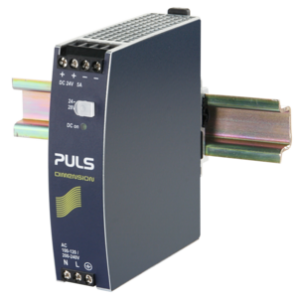 Powered from the PSD1001C supply module, it provides a stabilized 5V-160mA supply for field instrumentation with 500V input/output isolation, short circuit and reverse input polarity protection, remote sensing and regulation.